Make It “N” Take It Scarecrow organizers were well on the way toward hitting their goal of 2,000 scarecrows this year as the event hosted hundreds of families who gathered to build an amazing number of scarecrows on Saturday, Sept. 29. It was a perfect autumn day with bright sunshine and comfortable fall temperatures.. The entire city was buzzing but nowhere was as busy as the Scarecrow building site next to the dam. Saturday was the largest day of scarecrow building in the event’s 20 year history. 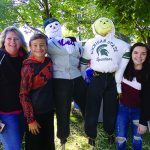 693 scarecrows were built that day and they could be seen in the arms of their creators as they strolled to their cars to take them home for the enjoyment of their families and neighbors. 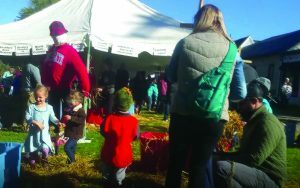 In addition, several hundred pumpkins, donated by Krupp Farms were selected by visitors who were invited to make their choice from a wide variety of pumpkins in exchange for any donation. 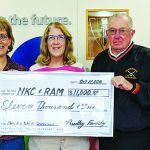 Those donations plus the proceeds from the scarecrows will be shared by North Kent Connect and The Rockford Area Museum, both of which depend heavily on donations and fund raising efforts. Donations for the pumpkins ranged from $10 and $20 bills from generous visitors to a few coins in the hand of excited children whose eyes were wide in anticipation of making their special pumpkin selection. 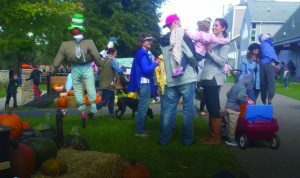 Every dollar and every penny raised by scarecrows and pumpkins is sincerely appreciated, but it was the smiles and laughter that filled the air that made the day REALLY special. Two deserving non-profits benefit from this event, and the City of Rockford did, as well. New visitors loved the scarecrows, loved the city, and loved Rockford’s people. We should all be proud. 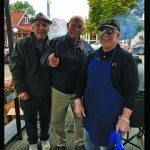 Make It and Take It’s only dark cloud hurt the event on Sunday as rain dampened the Saturday night and was also forecast for Sunday’s daytime hours. The good news is that, even though Harvest Fest will be over, Make It :N: Take It Scarecrows continues next weekend. 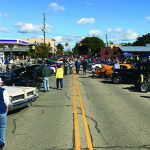 Hours are from 9 a.m. to 6 p.m. on Saturday, October 6 and 10 a.m. to 5 p.m. on Sunday, October 7. Everything needed to build a scarecrow is provided for a $10 donation. A $10 discount is being offered by Vitale’s Restaurant right across the street. Saving $10 on a great pizza is like getting a free scarecrow. The Scarecrow frames, clothing, and straw will be there. The pumpkins will be there. Organizers hope that many of our readers will be as well. Don’t miss this one-of-a-kind family event.